Happy Sunday guys and gals, I hope the weekend has been good to you thus far. I did an Instagram Q&A the other day and one of the questions I was asked was how I keep my skin so glowy and fresh. 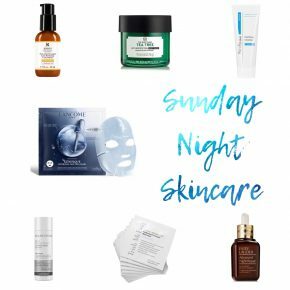 I briefly mentioned what products I swear by to keep my skin plump and luminous so I’m dedicating this weeks Sunday Night Skincare to discuss these products more in depth for you. I’ll kick things off with the Image Skincare Vital C Cleanser. Image Skincare Vital C Hydrating Facial Cleanser works to brighten the skin, soothe and reduce irritation and improve overall skin tone and texture. 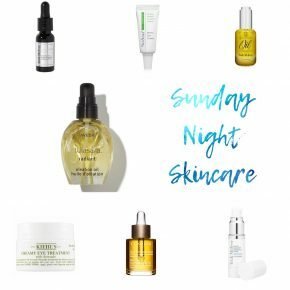 I also use the Image Skincare Vital C Hydrating Anti-Ageing Serum as part of my routine. Image Skincare Vital C Hydrating Anti-Ageing Serum is a hydrating serum that incorporates the new technology of oil-soluble Vitamin C along with Vitamins A, E, and highly potent antioxidants to nourish the skin and create a healthy, youthful glow. With its key ingredient, Vitamin C, the Vital C serum helps boost the production of collagen which gives the skin a plumping effect. The increased firmness smoothens out lines and wrinkles along with other major signs of ageing. The serum also protects the skin against the adverse effects of the sun by boosting its defense against ultraviolet rays and increasing the effectiveness of sunscreen. Vitamin E nourishes the skin with proper moisture to optimise moisture balance, thus preventing dehydration and dullness. 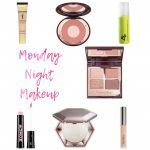 Another product I absolutely swear by is the Image Skincare Yana Daily Collagen Shots – a concentrated daily beauty drink that strengthens the skin by boosting the body’s natural collagen production. Collagen is the most abundant protein in the body and gives skin its strength and structure however, after the age of 25 we begin loosing collagen at a rate of 1% per year meaning the average person will have lost a quarter of the collagen in their skin by the age of 50 – scary I know! Uniquely formulated with Lumiplex technology this revolutionary product contains a highly concentrated proprietary blend of collagen peptides, ceramides, antioxidants and vitamins that deliver five powerful restorative compounds to increase the skin’s production of collagen, ultimately improving skin firmness and hydration. Bioactive collagen peptides are clinically proven to increase collagen by up to 65% in 60 days. Hydrolyzed collagen peptides have a higher bioavailability allowing ingredients to be absorbed more effectively. Lumiplex (a proprietary ultra-nutraceutical antioxidant complex) works to rebuild and repair skin on a cellular level, formulated for correction, prevention and nutrition. Skin moisture is increased by up to 40% in as little as 3 weeks. Fine lines and wrinkles are reduced in as littles as 1 week. 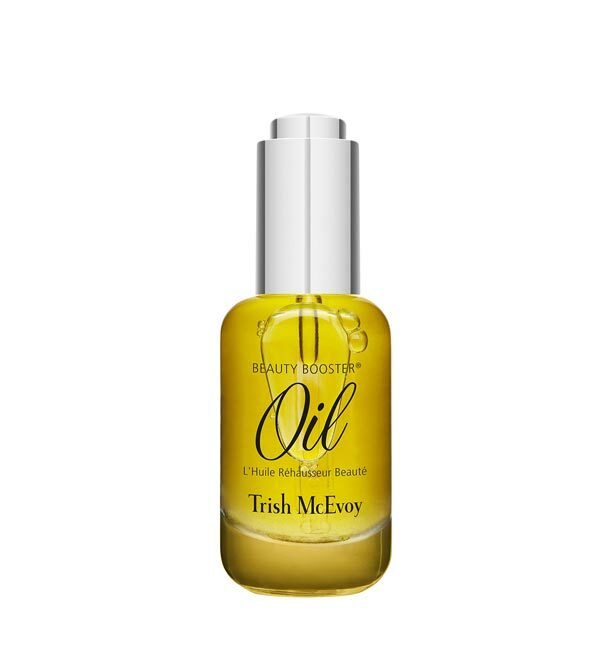 I also mentioned the Trish McEvoy Beauty Booster Oil in my Instagram Q&A, it’s most definitely a contributing factor to my skin looking so glowy and fresh of late. It’s a concentrated revitalising treatment that delivers a vibrantly healthy, hydrated and radiant complexion. The shake-to-activate formula delivers beneficial ingredients to delicate facial skin, helping to guard against environmental stressors while supporting the skin’s natural moisture barrier with the aid of essential oils. Its weightless, nongreasy texture absorbs on contact for a perfect pre-makeup finish and can be added to boost your favourite moisturiser or foundation and can be applied anywhere on your face, body or hair. 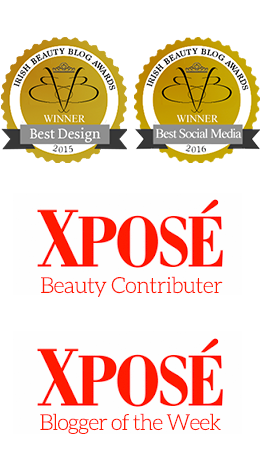 It contains Juvenessence (an algae extract that encourages firmer skin), Vitamin A (a plant-derived retinoid that helps nourish skin’s health), bioplasma (a marine microorganism that supports the skin’s natural moisture barrier) and Vitamin C which helps to even and brighten skin while fighting against harsh environmental conditions. Skin instantly looks and feels supple, hydrated and luminous after use. I have been using this for less than a year and I’m already on my third bottle – it’s incredible! You can buy it online or in store at Harvey Nichols, Dundrum Town Centre. The Body Shop Tea Tree 3-in-1 Wash.Scrub.Mask is one of the reasons my skin is blemish free and fresh – I use it every other day in the shower and constantly replenish it when it runs out. In a nutshell it’s a 3-in-1 product which can be used as a wash, scrub or mask to combat blemishes and excess oil. When used as a wash, the foaming clay removes impurities and excess oil. As a scrub, the exfoliants unclog pores, smooth skin’s surface and reduce the appearance of blackheads. When applied as a mask, the drying clay reduces blackheads and shine, deeply cleanses, mattifies and tightens pores. I personally use it every time I’m in the shower as a wash. I have combination skin meaning sometimes I’m dry and dehydrated, sometimes I’m sensitive and experience redness and skin tightness and sometimes I’m oily in certain areas meaning my skin produces excess oil and I suffer from breakouts. I don’t suffer from breakouts AT ALL when I use the Tea Tree 3-in-1 Wash.Scrub.Mask on a regular basis. My theory was actually put to the test quite recently. I left my Tea Tree 3-in-1 Wash.Scrub.Mask in Australia by accident and after about 9 days after my last use I started to breakout again! What does that tell me? I wasn’t using anything to control the production of oil in my skin and as a result I started breaking out. I’ve since bought a brand new one yesterday (Saturday 11th August) and used it this morning in the shower. My skin will start clearing up now over the next couple of days. Pricewise it’s extremely reasonable at €18.50 and it’s available in The Body Shop stores nationwide. 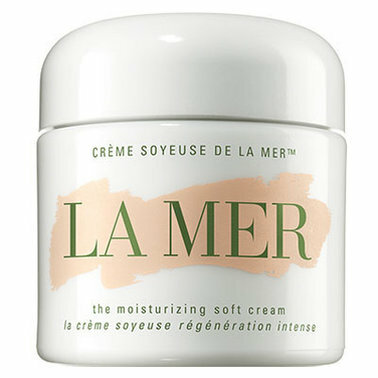 The moisturiser I’ve been using as part of my skincare routine is the La Mer Moisturizing Soft Cream. Created with microscopic moisturising spheres for the ultimate smooth and lightweight texture, this soft variation of Crème de la Mer delivers the same game-changing benefits as the original. At first touch, skin looks instantly radiant and naturally balanced as imperfections fade. Miracle Broth visibly softens, nourishes, soothes, and gives skin the energy it needs to focus on repair, while powerful antioxidant lime tea protects against stress and pollution for a healthy-looking glow and vitality that lasts. Miracle Broth is the legendary healing elixir that flows through all of La Mer and infuses skin with sea-sourced renewing energies. This elixir is formulated with hand-harvested sea kelp and other nutrients and minerals unlocked via a natural fermentation process. Surging with vital energies, it supports the five facets of natural healing: moisture, regeneration, soothing, smoothing, and radiance which help to bring skin back to its healthiest state. The iconic opal jar is hand-filled within eight hours of the Crème’s creation. Suitable for all skin types a jar of Moisturizing Soft Cream will set you back €140 for 30ml but it comes highly recommended and you can’t put a price on your skin. It’s worth every penny if you ask me! 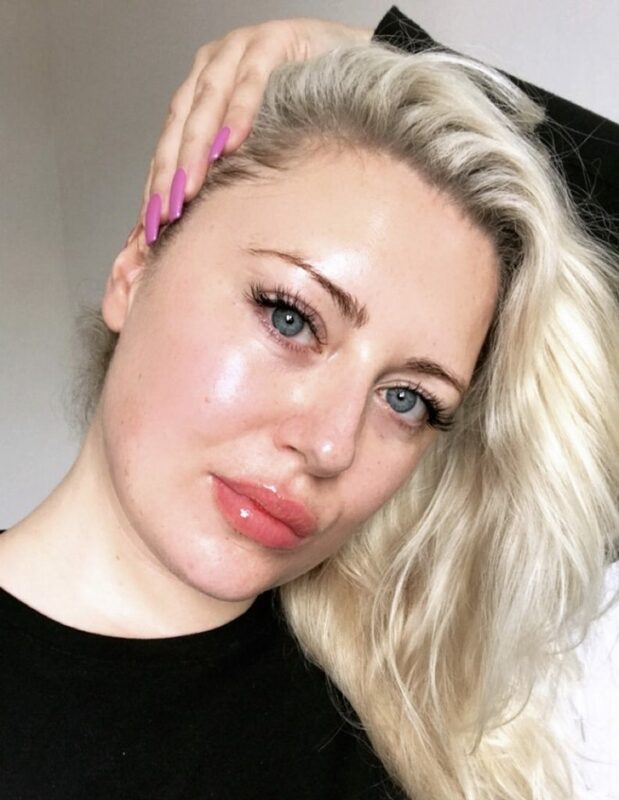 Last but not least, I’ve almost gone through an entire bottle of Paula’s Choice Skin Perfecting 2% BHA Liquid over the last few weeks and I can see a massive difference in my over all skin tone and texture from using it regularly. Paula’s Choice Skin Perfecting 2% BHA Liquid is a super-lightweight liquid exfoliant which combines 2% Salicylic Acid with a range of anti-irritants to care for skin. Salicylic Acid exfoliates the skin’s surface, gently sweeping away dead skin cells. It also penetrates inside the pore lining to treat clogged pores and fight acne. This toner-like liquid contains additional ingredients to let the Salicylic Acid penetrate faster and further. Paula’s Choice Skin Perfecting 2% BHA Liquid can also be used to treat Rosacea – Salicylic Acid is related to aspirin and has anti-inflammatory properties, so it can calm the redness whilst removing the flaky skin associated with Rosacea. I’ve been using Paula’s Choice Skin Perfecting 2% BHA Liquid twice a day, morning and evening, and have found it great for drying up my spots, smoothing skin texture and creating a more even skin tone. It’s priced at €32.95 and you can buy it online at Cloud 10 Beauty here. 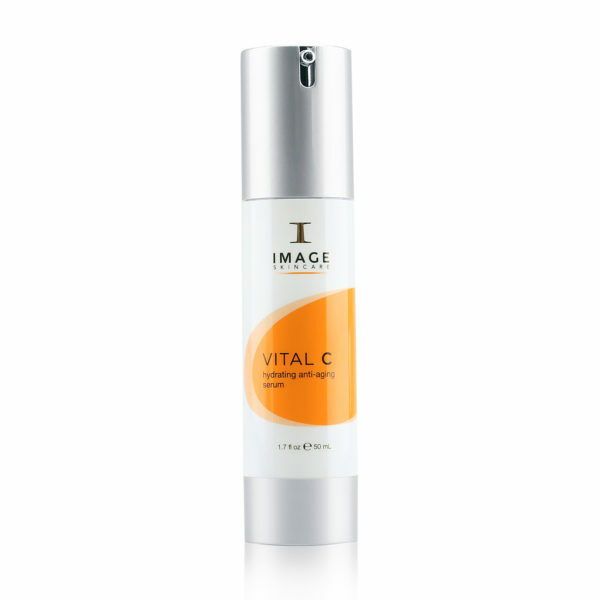 #Image Skincare Vital C Cleanser. 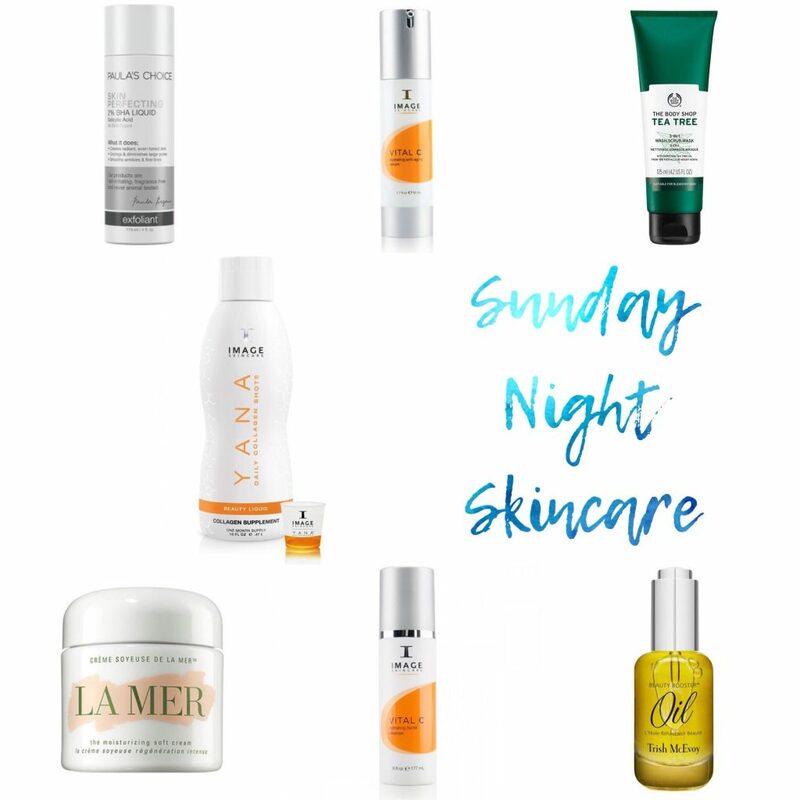 #Image Skincare Vital C Hydrating Anti-Ageing Serum #Image Skincare Yana Daily Collagen Shots #La Mer Moisturizing Soft Cream #Paula's Choice Skin Perfecting 2% BHA Liquid #The Body Shop Tea Tree 3-in-1 Wash.Scrub.Mask #Trish McEvoy Beauty Booster Oil.